Bruen5's got a Blog and other news! You guys all know Bruen5, the Party Planner of the CPN Team and neighbor in Neighborhood Survival right? Well he was just convinced by me and Molly222 to start a blog! But no worries, he is still a full time member of this blog. P.S. Thanks Zxz192 for answering Hedgehog's question. Hm... Maybe I should add mods to this site? Challenge #4: Snowball Flag Wars! This weeks challenge is a mixture of two games, Snowball Fights and Capture the Flag! It will take place at the snow forts, and is once again a team game. Each team will take a snow fort. (The orange flag snow fort is for the Beastly Bunnies, and the blue flag snow fort is for The Purple Puffles) In order for this to work, there will be no replacements during this challenge, so EVERYONE should show up! However, I will need two non Neighborhood Survival contestants to take the place as a flag. The object of the game is to get up to five flags, which will win your team safety for the week. Like capture the flag, when a penguin runs over to the opponents territory they can get out. But the only way to get them out is to throw a snowball at them! If you do get hit with a snowball, you must go to jail. The Purple Puffles will hold jail underneath the clock, and the Beastly Bunnies will hold jail in the shady low left corner of the snowforts, underneath the map and Spy Phone. There will be two random fans of CPN (probably either Mr. Acd, Himskater, Agent, The Maggums or even ealier voted off penguins on NS) who will stand behind each snow fort. They will act as flags. The only way to pick them up is to stand next or on them and wave. Then, the flags will follow your every foot step back to your side. The game will go up to 5, and like always the winning team is safe from elimination! WHY: Its the fourth challenge of NS! Now, if anyone out there wants to be a flag leave a comment telling me! We only need two! Slider94 is the only penguin who will not be attending this weeks team meeting because he is on vacation for the next entire week! Since he informed me about a week early, he is safe from elimination! This one is for Zxz192, and this one is for Hedgehog! This one goes to Outtacntrll. Lil Mock grins. Saavy starts to rock back and fourth. The Award shines in the sunlight. Saavy, here is your award! Frosty tossed him the last award of the day. The tough, the strong, the top five placer Lil Mock is shockling the third evicted from Neighborhood Survival. This goes to show how important it is to be a team player and to show up at challenges! Like Snowbuddy555 and Uncle Sonic, he will be walking down the Lame Lane, and catch a ride on the Loser Limo! We'll be seeing him in my very on Talk Show this Wensday, so be sure to to say hi! P.S. What do you think of my new music? Like it? The Soccer Game Results- The Purple Puffles Win! 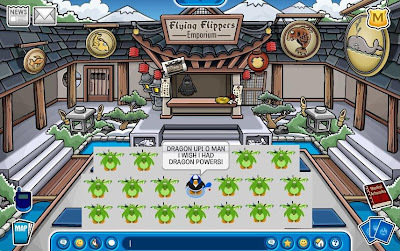 Today on CP was the first team challenge, the Soccer Game! It was one big event! Saavy, Zxz192, Slider94, Outtacntrll, Hedgehog, Molly222, Bob61732, Gappboy999, Bruen5 and Matt James all showed up! Some special guests that showed up were Sebastian7, Mr. Acd, Himskater, (Thanks for helping!) Rockhoppergp aka Juh76t, the some what famous Cena12121(He's on my buddy list!) and a WHOLE bunch of other fans of CPN who I can think of right this second! Throughout the game the score went up and down. At the beginning the Beastly Bunnies held the league, but than the Purple Puffles quickly took it. It was probably one of the most intense Club Penguin Soccer games EVER! Up above is a picture of everyone hanging out after the game. In the end, it was the Purple Puffles, the underdogs, who won. I don't think anybody expected it! Molly222, Bruen5 and Matt James did an especially good job. Who knows, this team might go places! I was able to get a picture with two of the best players, Matt James (Da Gamer) Molly222, and Bruen5. I've counted that Bruen5 and Matt James each scored about seven goals! Thats a lot! Once everyone left, Hedgehog, Mr. Acd and myself sat down for one last picture. They both did a great job! 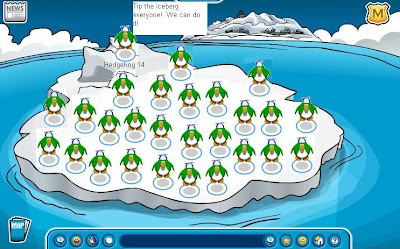 It was one of the funnest things I ever did on Club Penguin! So, now that you know who won, its time to vote off a NS member! Remember, only people on the Beastly Bunnies can vote, since they were the ones to lose. You can vote for ANYONE for ANY REASON! Chose your vote wisely! I'll be posting the Penguin Award Ceremony Sunday. Yesterday, Gapboy999, Polar Amigo, Molly222, Bruen5 and me all got out of school! To celebrate, we had a CPN team member exclusive party at my igloo, and hanged at the pool for short amount of time. It was a blast. Special Thanks to Sebastian7, for making this party able to happen. The Talk Show: Episode 2! The audience was waiting... The host was getting ready... Snowbuddy555 was about to sit in the Seat Of Shame. It was time for second episode of The Talk Show! Frostylittle walked onto stage, waving and smirking at the audience. He took a seat in one of the couches and was ready to begin. Frostylittle: HEEELLLLOOOO fans and readers of CPN! Welcome to the second annual Talk Show! The audience stands to their flippers and clapped with joy. Frostylittle: I'm your host... The one you all love... The creator and proud owner of Neighborhood Survival... Frostylittle! Audience Member: YOU ROCK!!!!! YA!!!! Frostylittle gives him a thumbs up. A few of the penguins back stage laugh. 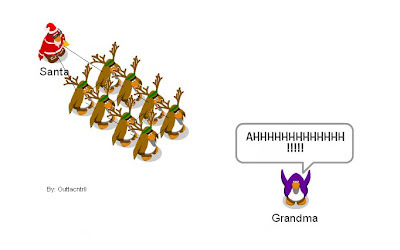 Frostylittle: Today on the Talk Show we have two important penguins sitting in the front row. Please give a round of a plaus for... Gapboy999! The camera zooms down to the audience and in front of Gapboy's face. He smiles and waves modestly and the camera moves on. Bruen5 smirks and gives a thumbs up to the camera. Bruen5: Thanks Frosty, I'm sicked to be here! Before he could finish, a member of the audience interrupts him. Audience Member: HEY! Bruen5 and Gapboy999 aren't the only members of NS in the audience! I'm here too! Frostylittle gives a confused look. The penguin stands up as the crowd gasps. It was a very familiar looking penguin. He was blue, with absolutly no clothes on. It was none other than Bob123456789. Frostylittle: Sorry dude but no body likes you! As I was saying, lets welcome in Snowbuddy555. Everyone but Bob cheers for the happy Snowbuddy555. She skips in and smiles with delight. Snowbuddy555: OMG! I am like totally sicked to be here! She gives a cheerful wave to the audience. Frostylittle: Are you actually happy to be here? Snowbuddy knods up and down. Snowbuddy555: DUH! I would so rather be here than in that icky, hard competition thingy! Some of the audience members gasp. Frostylittle: But than why did you even join? Snowbuddy555: To be with you and the original CPGA team of course! We used to have SO much fun! Frostylittle: So how have you been since being the only member of CPGA not to join CPN? Do you like Molly222 CP Cheats? Snowbuddy555: I like LOVE Molly222 CP Cheats! Its awesome! But I would totally like to be on the CPN team too! Snowbuddy555 gets a little red. Snowbuddy555: Because your like the next Mimo777! The audience cheers with agreement. Frostylittle: A lot 0f penguins said you didn't try at all. Is this true? Snowbuddy555: Well that week when you revealed the challenge, I was on vacation! And when I read the challenge it was like already Friday! So yah I didn't really have a chance to try! Frostylittle: Good point! If you lasted past this round, do you think you would have a chance of winning? Outtacntrll: You would have had no chance of winning! You know why? Snowbuddy555 makes a confused look. Outtacntrll: Because I'm in it to win it! The entire audience cheers for Outtacntrll and chants his name. Frostylittle: I've never heard you say that before! Bob123456789: I'm in it to win it! The audience starts to boo and throw food at him. Bruen5 stands up, places a tomato in his glove, gets into pitching position and throws the tomato as fast as he can right into Bob's face. Bob falls back in pain and passes out. Two medical penguins rush in and carry him away on a stretcher. Frostylittle: Ok... I'm just gonna ignore what happened... So Snowbuddy, are you happy with what place you've landed in on Neighborhood Survival? Snowbuddy555: Yup! I'm SO happy its over with! Frosty gave her a strange look. Frostylittle: Now its time for a new feature on this Talk Show called... Ask The Viewer! We're gonna tune in to three lucky fans of Neighborhood Survival and ask THEM a question! The curtains unroll behind the stage revealing a large, flat screen TV. It turns on and waits for Frosty's signal. Frostylittle: Our first viewer of the season is... Hillbilly9 from the server Ice Palace. Remember folks all of these penguins are REAL! The TV screen switches to the Ice Palace network. A dark green penguin wearing a fake beard, a pirate hat and April fools glasses is revealed. It appears he was in a Bambo Hut house. Hillbilly9: Howdy Frosty! I'm Hillybilly9! Frostylittle waves to the TV. Frostylittle: Welcome to the Talk Show Hillbilly! Frostylittle looks up to the screen. Frostylittle: Ok, my question for you is... What do you think of Snowbuddy555? Hillbilly9: Ah... Um... She's pretty and all but I don't like her one bit. She doesn't deserve to be in Naval Survival! Frostylittle gives him a dirty look. Frostylittle: Its Neighborhood Survival, not Naval! Frostylittle holds up his remote. Frostylittle: Alright, thats it! Bye Hillbilly! Frostylittle clicks a button changing the channel. Now on screen is a purple penguin, wearing a green explorer hat, a hawian neck lace and a blue apron. It was The Maggums. Frostylittle: Hello The Maggums! Hows it going? Frostylittle: My question for you is... Who is your favorite competitor on NS? The Maggums: Thats easy! SLIDER94!!!!!!!!!!! The Maggums pulls out a picture of Slider. The Maggums: Because he is AWESOME!!! His site ROCKS!!!! His outfits are GREAT! And his personality is SPECTACULAR!!!!!!! I AM HIS NUMBER ONE FAN!!!!!! Frostylittle: I see that! Well nice talking to yah! He clicks the remote one more time. Now on the screen is a pink penguin in a large fancy hat, a purple dress and is holding a purse. Frostylittle: Pigatron, it says here your a boy. Pigatron makes an angry look. He talks in a scratchy voice, showing that he is a smoker. Pigatron: What you got a problem with a man wearing womans clothing?!?! Its a free country!!!! Frosty makes a scared look. He held up the remote. Pigatron: WAIT!!!!!! Can I get ya number? Frostylittle: NO! YOUR A MAN LADY!!!!!! He clicks the remote and sighs in relief. Frostylittle: Well thats the end of our show folks! Snowbuddy555, do you have any last minute comments? Snowbuddy555: Can I like touch your hair? Frostylittle: Ah... No. But I do get that a lot! The Audience: THE TALK SHOW!!!! P.S. Tonight at 8:00 pm Estern Time, Slider94 is holding a meeting for the Beastly Bunnies in his chat box. It is very important to show up! 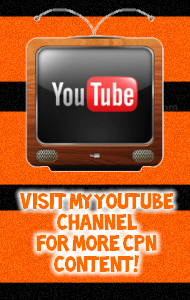 Hiya Penguins and fans of CPN! It is time for the third challenge of this season, Soccer! This is the first challenge so far with teams, which means you'll have to get along with your teammates or... Bye bye! Beastly Bunnies, your team color in this challenge is blue, and dress as if your really playing soccer. If you want, it might help to put on some kind of bunny ears from the Easter Egg hunts over the past years. Purple Puffles, your team color is red and like the Bunnies, wear soccer clothing. It might make you more of a teammate if you bring a purple puffle with you! Also, a good idea for this soccer game is to combine your usual outfit with a soccer uniform. If any penguins or fans of CPN want to come watch this epic Soccer game, please sit in the stands for the game to end. I only gave one penguin instructions to come help me judge. (you know who you are) I'm sorry to say but if you miss this Soccer Game, it might cost you the game. The only penguin in Neighborhood Survival who is aloud to miss it is Molly222, since she already told me. (She might show up though) So that means EVERY SINGLE player in NS must show up! If you don't know the teams, scroll down to post with the title: Beastly Bunnies VS Purple Puffles! Just to let everyone know, I'll be on the chat box during the challenge so I strongly suggest you do too! I'm also very sorry for posting this post a day late, I had some PC problems! Outtacntrll, once again for winning the challenge. Next is Slider94, Hedgehog 14, Zxz192, Molly222, Bob123456789, Polar Amigo, Bruen5, Gapboy999, Saavy and... Da Gamer. Snowbuddy555 starts to sweat. Lil Mock remains calm. That means that Snowbuddy555, one of the threee girls of Neighborhood Survival is the second eliminated from the competition. Like Uncle Sonic, she will now be forced to sit in the dreadful Seat of Shame on the next episode of The Talk Show. Unlike the past elimination, everyone voted her out but herself. Tune in tommorow for the first challenge with teams! Earlier today Da Gamer throw a birthday party and it was awesome! A lot of people in Neighborhood Survival made it! Sadly, Molly222 had a soccer game so she couldn't get in on the fun but... Bob123456789, Matt James/ Da Gamer, Slider94, Outtacntrll, The Maggums, Bruen5 and and a few other random penguins showed up. It was one great way in kicking off the summer! It was a heck of a party and I hope Matt James had a great time! Happy B- Day! P.S. If you haven't already read the post about the teams, scroll down! Its important! Beastly Bunnies VS Purple Puffles! Today out in the real world, I was watching a lot of reality shows like Big Brother, American Idol, Survivor, The Apprentice and I'm a Celebrity Get Me out Of Here looking for tips for Neighborhood Survival. I noticed that a lot of shows had had teams and a light bulb went off in my head. What if Neighborhood Survival had teams? I have a feeling that the Bunnies might be a very strong team. A lot of their members come close to winning, so they sure are a threat! Ok, I know that a lot of you probably think these teams are uneven. But there not. I based the teams on how well the cast mates do in the challenges, friendships and their blogging experience. I hope it works out ok because these are the teams for the season! P.S. Tune in Sunday for the Penguin Award Ceremony! The Talk Show: Episode 1! The lights turned on... The camera was set... The audience was ready... It was time for the first episode of the Talk Show! Frostylittle: Hello everyone and welcome to the first episode of the Talk Show! The audience screamed with excitement. Frostylittle: I'm Frostylittle, the creator of Neighborhood Survival and host of this show for the next 14 episodes! Are you ready for the drama to begin? Frostylittle: Alright than! Lets welcome the first evicted penguin of the season! UNCLE SONIC!!!!!!!!!! The audience starts to clap. Uncle Sonic slowly walks in, with a frown on his face. Frostylittle: Welcome to the Talk Show! Are you ready for the interview? Uncle Sonic nods up and down. Frostylittle: How do you feel about being the first thrown out of NS? Frostylittle's eye brow moves up. Frostylittle: Ok... Did you expect this to happen? Uncle Sonic tilts his hat down. Uncle Sonic: I knew I wasn't ready so yea kinda. Frostylittle: If you weren't evicted who do you think would? Why? The audience starts to get quiet. Uncle Sonic: Bob123456789 because he got the most votes. Some of the members of the audience gasp. Uncle Sonic's eyes grow wider. Frostylittle: Ok, this doesn't really have to do with Neighborhood Survival, but... Why did you close down your blog? Uncle Sonic: My blog isn't really popular and well dagamersite had an open spot so I asked and got in! Frostylittle: Cool! What are you planning do to now? Uncle Sonic: Watch who wins NS and also help dagamersite. I'm the pin finder on his site you know. Frostylittle: Once again, cool. Are you still going to follow my blog for updates? Uncle Sonic: Oh yeah! Gonna check it and congratulate who wins. One of the members of the audience stands up. Audience Member: YAH! CPN ROCKS! Frostylittle: Thanks man! Alright, back to business. Who are you rooting for? Uncle Sonic points to his badge, which says " Gamer Gang VP"
Uncle Sonic: Well... since I am apart of Dagamersite probably Dagamer because he is my boss. (Don't wanna get fired) LOL! JK! Dagamer wouldn't fire me. Frostylittle: Who do you think will be evicted next week? Some of the members of the audience start chanting Bob123456789. Uncle Sonic: Gonna have to say bob123456789 because he didn't do too well on first challenge. Sorry bob123456789! Another member of the audience stood up. Audience Member: YAH! YOU TELL EM'! Frostylittle: Did you like your short time on Neighborhood Survival? Uncle Sonic shakes his head. Uncle Sonic: No, but somebody has to go first! Frostylittle: Good point! Any other final comments? Uncle Sonic: Good luck to all and go Dagamer! Goodbye! Its been fun! He waves to the audience, and smiles. Frostylittle points to the audience. Audience: THE TALK SHOW!!!!!!!! YEAH!!!!!!!!! 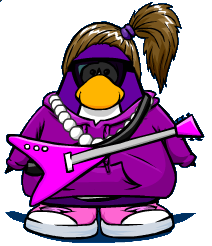 Oh and for all the penguins in Neighborhood Survival, you MUST send in your player card some time tomorrow! I've only gotten them from Outtacntrll and Lil Mock. When you do post or email it, leave a comment telling me where to find it. P.S. I know I'm supposed to post the Talk Show today, but Uncle Sonic and me had some connection problems! So I'll be emailing Uncle Sonic the new time and place now. Its time for the second challenge of this season, Money Maker! 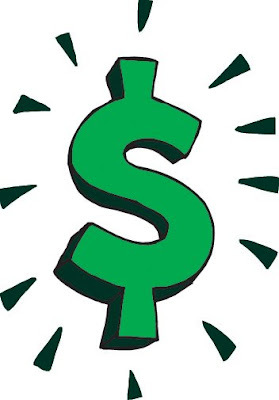 As its name suggests, Money Maker is a challenge that involves earning money. Every penguin participating in Neighborhood Survival must ALL try to earn as mch money as possible. The penguin who wins the challenge is safe from elimination for this week only. Remember, I can tell the difference between a player card with fake numbers or numbers copied from some where else so don't try to cheat! I will be dertimining your places on the amount of money you raise so try your hardest! The only way to give me your player card to to either A: Email it to me at griffdog200@aol.com B: Post it some where on your blog and leave a comment telling me where to find it! What's up my fellow penguins! Today, on the server Icebound, Mimo777 was throwing a party! Thanks to the help of Molly222 and Outtacntrll, I was able to find Mimo at the Iceburg! There, I saw some penguins from Neighborhood Survival like Lil Mock, Molly222, Outtacntrll, Bruen5, Gapboy999, Polar Amigo and Snowbuddy555! It was a fast but fun party! Since I couldn't add him as a buddy, I put him on my ignore list! This was my first Mimo party and it was pretty sweet! P.S. Don't forget I'll be posting the next challenge tommorow! Outtacntrll, for winning the challenge! The next one is for Gapboy999, Saavy, Lil Mock 11, Hedgehog 14, Da Gamer, Polar Amigo, Bruen5, Snowbuddy555, Zxz192 and Molly222. There are still three, nervous penguins in front of me. Bob123456789, Slider94 and Uncle Sonic. You all gathered up at least one vote. 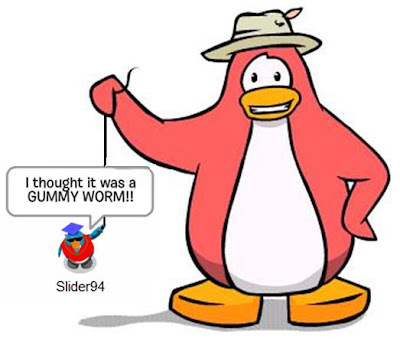 The next penguin award goes to... Slider94. That means that Uncle Sonic, the last person to join Neighborhood Survival, is the first penguin eliminated from the competition! This poor guy will have to schedule the Talk Show with me and will be sitting in The Chair Of Shame! If your out there be sure to leave a comment telling me what times are good for you! Below are the results of the first Neighborhood Survival challenge, Funniest Moments! FIRST PLACE: Outtacntrll- Congrats! Your safe from elimination! Good job! Today, when I was using my chat box, I noticed that Outtacntrll was on! I asked him to meet me on CP and I hung with him for a while. He's a pretty cool dude. We first meet at the cove, and danced in the water for a while. Some penguin named Feno was following Outtacntrll every where! Check out Outtacntrll's igloo! Pretty sweet right? P.S. Remember, the funniest moments post is still up! I haven't gotten them from Slider94, Outtacntrll and Breun5! Hello Penguins of Neighborhood Survival! It is time for the first, official challenge of Neighborhood Survival, Funniest Moments! In this challenge, every one of the competitors must submit a a funny moment PICTURE. This funniest moment must be easy to understand and different from the others. The winner of this challenge will be safe from elimination for week one only. The only way to give this picture to me is by email( my email is griffdog200@aol.com) or posting it on your blog. If you are POSTING it, be sure to leave a comment telling me! Remember do be unique and try to make it as clear as possible! I will be announcing the winner and what places the rest of the cast came in on Friday. If I were you, I would look around at the other blogs owned by the other cast mates and their funniest moment. You should also check out my twitter page for some more tips. Good luck and try your hardest! P.S. In case you didn't notice, a few smart penguins were able to figure out my clues and do the contest earlier! We've got a Chat Box! In other news, Darkpuma is the only member of Neighborhood Survival who hasn't really been commenting or letting us know he's in. So I decided to replace him with a penguin named Zxz192, who has been asking to join for a while. But he's not the only one. As of right now, I have added in Uncle Sonic too. The only problem is I don't know his blog or email address, so I'm haven't a hard time finding him. Can anyone help? Remember Neighborhood Survival starts Monday! Monday: On Monday mornings, I will reveal the challenge for the week on this blog. Remember to try your hardest and complete the required info. Monday-Friday: Monday through Friday is the time when you complete the challenge. I think this will be enough time... Right? Friday: On Friday, I will reveal the results of the of the challenge. I will also reveal what places the neighbors came in. (Who won and who came in last etc.) The winner of the challenge will be safe from elimination for the week. Friday to Sunday: From Friday to Sunday, EVERY NEIGHBOR WILL VOTE for who they think should be eliminated. You can vote for anyone you want for any reason. The only way to vote is to comment. Sunday: On Sunday, the elimination ceremony will take place. There I will reveal the eliminated neighbor. Neighborhood Survival will start June 8, 2009 (That's next Monday!) So be sure to check out my post for the challenge. I've been BURNING to ask you guys this question, who do YOU think will win? If your a competitor on Neighborhood Survival, it might help to get some extra scoop! Also, if you want to find ANY parties for this blog, I'll be posting them on twitter only. 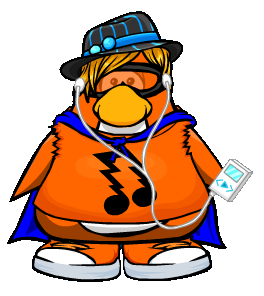 Remember penguins part of NS, send me in the picture of your penguin fast! Hiya Penguins! Ok, on my last post A LOT of the cast members of Neighborhood Survival have been asking me questions. One of the biggest ones involves Darkpuma. He has finally commented back and has asked to join Neighborhood Survival. I have decieded that since he was one of my top choices from the very begginning, I'll let him join. Our cast of NS started out as 10,than went up to 12 and now it's 13! Wow! Right now, I have encountered a problem. I can't turn the background of OTHER penguin's player cards white! So, now I ask that you send in a picture of JUST your penguin. Make sure the background is white! Remember, I'm going to be copying your penguin onto a poster board so be sure to use the button PRT SCR on your key board to take the picture. Now, the only way to send this to me is by email or posting it on your blog. IF you post it on your blog, make sure to leave a comment telling me where to find it! My email is... griffdog200@aol.com Any questions? P.S. I'll try my best to answer all of your questions as soon as possible!